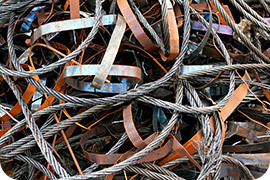 Scrap metal businesses in Washington will need to be licensed with the Department of Licensing beginning January 2014. However, businesses will not be able to apply for these licenses until January 2nd when the license applications are available. The Department will reach out to law enforcement agencies to make sure they are aware of this delay, and are not citing businesses for unlicensed activity. Even though licenses will not be immediately available, the remainder of the new laws and rules regarding scrap metal must be complied with. The Legislature passed House Bill 1552 last session, with the intent of reducing scrap metal theft by requiring the licensing of scrap metal businesses, and establishing new requirements for scrap metal transactions and record keeping. DOL will have the applications available sometime on January 2, 2014, so please check our website regularly for updates. If you have a question about who needs a license, the licensing process, or any other questions regarding the licensing of scrap metal business, please see our website at: http://www.dol.wa.gov/business/scrapmetal/. You are currently browsing the Licensing Express blog archives for November, 2013.